Running one of the most luxurious brothels in Texas at the turn of the century was Madam Fannie Porter. Fannie was born in England in February 1873 but moved to the United States with her family when she was just one year old. 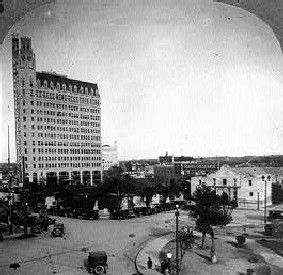 As a young teen she married, but by the time the Wild Bunch was making their way to San Antonio in the late 1800’s, she was widowed, running the successful bordello, and gladly welcoming the outlaws into her fold. Located in San Antonio’s Second Ward at the corner of Durango and South San Saba Streets, the house was built in 1893 and “advertised” itself as a “boarding house.” Fannie, herself, was mentioned in various city directories from 1890 until 1902. The house was said to have boasted fine glass fixtures, silk sheets, and plush carpeting, and for her “special customers,” including members of the Wild Bunch, she served chilled champagne. For several years, the brothel served as a rest stop, hideout, rendezvous, and headquarters for Butch Cassidy and the rest of the Hole-in-the-Wall Gang. In fact, it was here that Harry Longabaugh, better known as the Sundance Kid, is thought to have met Etta Place. According to some accounts, the beautiful Etta was working at Fannie’s place as either a prostitute or chambermaid and it was Longabaugh who set her up as a teacher so she could start a new life. Harvey Logan, known as Kid Curry, also met his girl, Annie Rogers, at Fannie’s brothel. 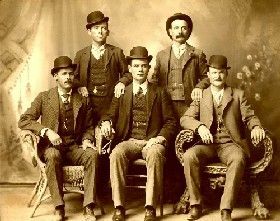 Wild Bunch, aka: Hole in the Wall Gang (1896-1901) – Led by Butch Cassidy, the Wild Bunch terrorized the states of Colorado, Wyoming, Montana, Idaho, Utah, and Nevada for five years. Click for prints, downloads and products. Though Fannie was well-connected and operated the brothel for the most part without interference from the law, she does show an arrest for “vagrancy” in the late 1880’s. “Vagrancy” was the term generally used in police reports to describe prostitution at the time. On the other hand, Fannie, who was described as a “hard and shrewd woman” was also known to chase police officers from her place with a broom. When the census was taken in 1900, Fannie’s “boarding house” was called home to five women, ranging in age from nineteen to twenty-four. The last time that the Wild Bunch is known to have visited her brothel was in February 1901, when they were between the bank robberies in Winnemucca, Nevada, and Wagner, Montana. With the law on their heels, the gang planned to split up and head in different directions. But before they rode out for the last time, Fannie threw them a going-away party. Not long after the Wild Bunch were either rounded up or disappeared, moral reform began to turn against openly operating brothels. Fannie closed her house and faded from history. However, some historians believe that she retired a rich woman. Speculation abounded that she had married a wealthy man, other rumors indicated that she went into seclusion in Texas, while yet others say she returned to England. No one really knows. Later rumors said that she died in a car accident in El Paso around 1940.